Our phenomenological examination of learning game design is situated in a four-year, longitudinal design-based research project that encompasses iterative design processes to develop, refine, and study a game-based learning platform called E-Rebuild. 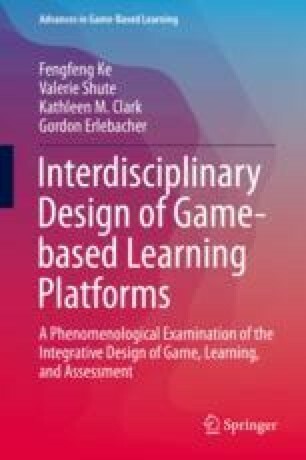 This chapter presents an introductory overview of the four facets of the interdisciplinary educational game design—interdisciplinary collaboration, learning-play integration, integrative task and assessment design, and game-based learning support. We then provide a design chronicle of E-Rebuild as the key setting of the phenomenon examined, by explaining its iterative design, testing, and refining processes. The authors’ researcher positionality and reflective summaries of design experiences are presented as well. Rodriguez, H. (2006). The playful and the serious: An approximation to Huizinga’s Homo Ludens. Game Studies, 6(1). Retrieved from: http://gamestudies.org/0601/articles/rodriges.